Disney collectable minifigures series 2 revealed! You can view a larger image of the full set after the break and individual figure images are now in the database. They'll be available from May 1st and we'll bring you our review as soon as we have our hands on them. WONDERFUL !!!! Everything may be missing but this series really is not !!! I'm getting Anna, Elsa and Frozone but overall this is a pretty damn uninteresting series. Very disappointed in the inclusion of the 2 Steamboat Willie figures, I wasn't planning on buying that (ridiculously overpriced) set but now its completely out of the question. Are Mickey and Minnie the same as Steamboat's ones? I'm glad that the steamboat set figures have unique printing on them. Gives them more value. And that explains the work around the no new molds for the steamboat minifigs. Scrooge looks pretty good. Little disappointed in Jafar. I’m pretty excited to see my favorite Hercules very unexpectedly standing back there! Chip and Dale have great expressions on their faces, but Huey, Dewey, and Huey don’t look quite right. Wish there was a Goofy fig. Only figures i'm disappointed with is Anna and Elsa since they've already appeared in several sets. All the others are great. I guess the two vintage figures aren't that exciting either since they are coming out in the new set. I want them all! Especially Kwik, Kwek en Kwak (Huey, Dewey, Louie). But indeed, where is Goofy? Pluto has been packed in a few sets. @ericjohn I agree they could be better, and it would be nice if they had the coloured/black caps, but still I'm glad they are included. Some nice ones there, and at 10 whatever coin to go with all the 5s is great. Gotta get scrooch Mcduck and the 3 ducktails kids.. I like Frozone and Hercules but lego could of put abit more thought into the other characters, would of been nice to see Eyore, poo, piglet, tigger, pluto, king triton, tinkerbell, Pinocchio, Mary poppins and Dumbo in this series..
Hercules and Hades are going on my wishlist, for sure... Anna and Elsa look nice, too, but... not outstanding, just nice. The others, I could take or leave; but it's still neat to see more Disney characters rendered in minifigure form. When I heard that the spring series was going to be another Disney series I thought I might pass . . . but these are great! Such a great diversity . . . from Hercules to the Incredibles . . . and even Jack Skellington! My only wish is that Chip and Dale were the Rescue Rangers version . . . and I'd also love a Webby or Launchpad!! Dang, no Belle or Beast? I am excited to see this. Are there others I wish were in here? Sure. Pluto, Goofy, etc. I am just thrilled, though, there are more. By the way, the somewhere mentioned $3.99 US | £2.99 UK | 4.99 CAN seems pretty reasonable this time, especially for the latter two. Wow, I had already forgotten I was waiting for these! Jack and Sally are a must, of course (unlike their lackluster Brickheadz), as are Vintage M&M. Noice! I will pick these up just to have. I don’t love all of them, but oh well. I had heard rumors they were putting the steamboat inspired figures in this series, so makes sense. And really disappointed Chip and Dale don’t have coats/shirts on. Don't have any Disney figures so far, but Chip and Dale (wasn't even aware of their English names until now) are must haves for me, they look awesome! I for one want all of these. Also @Bycougars while Anna and Elsa are in a few sets, they are not in minifigure form. but the friends doll form. Well here goes a Disney marathon tonight. This series is the one of the GOAT. Speaking of which, I’m disappointed a goat wasn’t included. WAIT OH MY GOODNESS ARE THOSE MEDIUM SIZED LEGS ON CHIP AND DALE? Awesome. That ship's wheel Mickey is holding looks hilarious by itself... Does this mean Steamboat Willie sank?? I love it and hate it. I was hoping for Queen of Hearts, Mad Hatter, Snow White Witch, Snow White, Lilo, GOOFY!!! The 80/90s child in me loves it through. I will buy them. But... 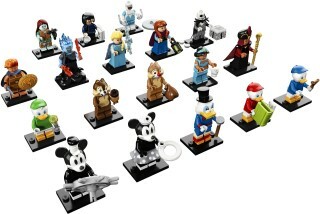 Suppose they needed to save the good Characters for LEGO Disney Collectable Minifigures Series 3? I find the lack of Goofy disappointing. Also it would be pretty cool to get a Sora minifigure someday. Pretty good series. I have no interested in Hercules / Incredibles but will probably go for the rest. The Frozen ones look great. That Hercules is incredible - best CMF in years! Goofy, a Pluto accessory, Belle, Beast, Snow White, Dopey, Mad Hatter, Lilo, etc, would’ve made this fantastic. If there’s not a Series 3 eventually then this is a big letdown. Scrooge, Hercules, Hades, Edna, Jasmine, and Jafar look great, the rest are all mediocre. Louie, Dewey, and Huey’s eyes creep me out, Chip and Dale are a nice addition but kind of boring, Steamboat Willie Mickey and Minnie are completely unnecessary considering they’re the exact ones from the set, I though Frozone was already in the Incredibles 2 sets(maybe he isn’t though), I guess Anna and Elsa are okay but I have no interest in them, and I find the Nightmare Before Christmas ones bland. In my opinion, Lego should’ve held off on Nightmare Before Christmas and given precedence to some classic characters like the ones I mentioned at the start. Maybe there is a fanbase for that movie, but I don’t know anyone who likes it and I’ve never even watched it. Jasmine would be the only one for me, so bricklink that will be. i lucked out with the TLM2 CMFs and got the only one i wanted on my first bag--no way that luck will strike twice! I guess those people predicting the Ideas hats were for the CMF were right. A shame that this might slightly devalue Steamboat Willie in most peoples eyes, but I think the build itself is so good it shouldn't matter. My personal highlights of this series have got to be Jafar, Hades, Jack Skellington, and Frozone. While I don't have much interest in them personally, I think it's fantastic that all three of the Duck Tales Kids *and* Scrooge are included! All in all, this series doesn't seem as impressive to me as a whole as the first Disney series, but I want more of the figures from it a lot more (had practically no interest in the OG.) That's a bit weird, guess I always liked the "non-iconic" Disney characters more than the iconic ones. I guess you could say this holds more collectability value to me while the original has more display value? I'm not sure. Though not as good as the original. As much as I love this, I’m really kinda disappointed that there’s no Lilo. Mickey and Minnie are slightly different than the ones in the ideas set, but close enough to eliminate any thoughts I had of buying that set. The figures look great, but where are Goofy and Pluto? When you consider the enormous cast of Disney characters from which Lego can choose from (Pixar, classic cartoons, Disney Princesses, etc. ), this is probably only the second of many more CMF series to come. Cool series, shame they went for vintage and not DuckTales Style. These look great. My top picks to get: Jasmine, Jafar, Sally, Jack Skellington, Scrooge McDuck, and Hades. Nice proper versions of Anna and Elsa, with minifigure proportions and film-accurate hair. Inifinitely superior to the crummy minidoll versions (shudder). I don't understand why the "Nightmare before Christmas" figures are included and I don't care to much for Frozone and Edna. I think there are more iconic characters in Disney history that would have looked great in a Lego overhaul. Like Moana, Mulan, Cinderella, Pinocchio. Hades and Herc look great, I wasn't expecting Chip and Dale en Scrooge though. I was a bit disappointed after having heard that another Disney CMF was on the way...but now, I like the included figures. I like the classic Mickey and Minney, this way I do not have to buy them in Bricklink (because I did not want to pay 90 € for the set, it is very expensive). I love Scrooge McDuck, Huey, Dewey, Louie. Perhaps, the ones I do not like so much are those from recent films, as they are not the Classic Disney characters I love!! Mostly disappointing to me, but then I don't like modern Disney. Hercules might be worth a buy on the aftermarket, maybe Scrooge too (mostly due to Keno Don Rosa, bless that guy), but the rest are very easy passes. Is it just me or are the Kid Ducks legs New? Wow. Easy pass for the whole series. Only really interested in Frozone and Edna Mode. Jack Skellington is a good looking fig but haven't seen Nightmare Before Christmas so might not get. No Rajah or Iago. Boo. And as much as I dislike the end-of-the-Age Hercules movie compared to others still having no representation, nice to see the flaming duo-mold head making a new appearance. While The Nightmare Before Christmas might seem like a pretty niche movie and not be as wide-known as others, it does have a pretty big fan base. Plus, it's represented everywhere in the theme parks around Halloween and Christmas. As with the first series, the selection is a bit all over the place in terms of what made the cut. But I enjoy what they have here. Because of their presence in the mini-doll line, I could have done without the Frozen characters. They are well done though. Goofy and Pluto are really needed though, and I can only hope there is a 3rd wave or even some type of set that they'll be made available in. @Golem25, I don't feel like there would really be much savings in getting a minifigure on the aftermarket. At the price they go for to start, you can't be saving but a few cents, if that, by buying afterwards. Even bricklinking certain parts of him probably isn't worth it in the end. Not interested in Huey, Dewey, Louie, Chip and Dale nor Mickey and Minnie. That's 7 figures which are just 3 sets of characters. Scrooge could have been cool, but his head looks squarish and weird. Hades, Jafar, Jack, Hercules, Jasmine and maybe Sally are the only ones I'd like to buy if possible. Hades and Jafar are must-haves. Edit: No Goofy is a huge missed opportunity. Also, Edna and Frozone ALREADY have minifigs! So many wasted spots in this lineup. Edit edit: The steamboat willie figs could have been something else. Those parts don't have to be used for the exact same purpose! There has to be a character or two with similar hats they could have done instead! Am I missing something? Mickey and Minnie look same as steamboat willie? Never cared for the custom-headed ones (don't look LEGO enough to me), but some of the LEGO-fied ones are really nice. Anna, Elsa, Jasmine, really nice! Hyped for Jack Skellington and Sally too. I don't think this series is as good as the first- Disney Minifigures Series 1 was the first series I completed a set of figures for because I loved them so much. The ducks here feel useless, as do Chip and Dale, although I guess Scrooge is nice. Goofy continuing to be left out is ridiculous- I hope he's in the D2C with Pluto. The Steamboat Willie repeats are also a wasted slot, as they remove most of the appeal of the set itself- and given that it's so overpriced, it needs all the appeal it can get. The other figures look amazing, though, and definitely of the same quality as the original series. There are so many missed opportunities, though- Belle, the Beast, CINDERELLA, Snow White, Aurora, etc. Considering how popular and strong the Disney Princess brand is (they even have a dedicated minidoll theme to themselves, even if it's been renamed "Disney"), I find it extremely strange that the only classic princesses we've gotten are Ariel and Jasmine. Frozone, Edna Mode, and that does it for me. Hades looks dead oh look Edna. I am very pleased about the inclusion of Steamboat Willie and Minnie. This was totally unexpected after the release of the Ideas set, but now it gives casual fans like me the chance to "opt out" on the massively overpriced set and just pick up the minifigs. With the big wheel and the life preserver, they will be easy to feel for as well. Considering how much advance planning goes into the minifig series, this cements my theory that Steamboat Willie was in development prior to the Ideas review. At the very least, the minifig form was, which explains the hat mold. No doubt, Lego greenlighted the Ideas project to avoid accusations that they "stole" the Ideas concept similar to what happened with the Ghostbusters firehouse. Having very similar Steamboat Willie-based minifigs to the Ideas set seems like it will make the already prohibitively expensive set even less of a draw. They could have easily done classic Mickey and Minnie with pie eyes. Something different than just lacking silver. If I was the fan designer of that set, seeing this would be pretty upsetting. I was considering picking up the steamboat, but now I don't see much reason to. I don't care to have two very similar figs on my shelf so I'll just buy these figures instead. The omission of Goofy seems strange, seeing as his absence was one of the biggest complaints about series 1 that I can remember. I'm amazed the Chip and Dale moulds are actually different - with different teeth & hair. Shame Edna Mode didn't come with a cape. - "NO CAPES!" Who wants those Mickey and Minnie after releasing them in Steamboat Willie set? Edna and Frozono are a big pass, and Chip and Dale are not really a big deal (their short legs in different colours are gonna be very useful for one of my projects though). I am surprised we didn't get Wreck it Ralph and Penelope and any from Toy Story since those are the other current movies happening right now. I will say this bodes well for yet another Disney series since these only seem to touch the surface of the depths of the Disney characters. Disney Princesses were presumably not included because they have their own theme. I don’t feel that there is a need for them as they appeal to those who like the Disney Princesses sets. This series focuses on the classic characters like Mickey Mouse or Donald Duck. Personally I am actually impressed with this series! Huey, Dewey and Louie were missing from the first series and I think they look great! Chip and Dale are a nice inclusion, and Frozone is here! Finally! I am very disappointed with some of the choices though. The Mickey and Minnie are a wasted slot and although they should be in the series, I would prefer a different variant. Anna and Elsa are just stupid choices really. I get how successful the film was but do they really need to be in this series? No. Where is Goofy? As one of the most important characters in Disney’s history, I would like to think he would be somewhat included. Winnie the Pooh has never appeared in LEGO form and I think he could definitely have been included. Overall a solid series, but some repetitive choices. Now I'm really glad I didn't buy any of Series 1. No Goofy here. No Lilo makes me sad. But im happy we are getting triplets and Scrooge! What happened to the quality of LEGO 3D renders? This looks awful. I'm for sure getting Herc- baby you mean HUNK-ules, Hades, Jasmine, Jafar, Sally and the Pumpkin King, Frozone and maaaybe Edna. And can have a Battle Royale between Elsa, The Ice Queen from Series 16 and Killer Frost (76098)! @stevesheriw, I was thinking the same thing in regards to Steamboat Willie and the Ghostbuster fiasco. For all we know this figure was planned way in advance, and when the Ideas submission made the final round, they felt the need to approve it and not get slammed again. Because we know tons of people would cry fowl and claim they stole idea. Technically speaking, Frozen is the only set here from this decade (although sequels to The Incredibles, remake of Alladin, a reboot of DuckTales, and Jack and Sally a constant presence at Hot Topic shelves probably makes them feel more modern than they actually are). @Golem25 I’m not sure what you consider modern Disney, but these are all from movies that are at least 20 years old besides the Frozen and the Incredibles characters. Yawn. I don't even see any interesting accessories in this lot. Easy pass. @DaftArcher20968: Winnie the Pooh and friends have appeared in Duplo form (sets 5945, 5947, 2982, and others). That said, a minifigure-scale set of characters would be fun to see. @Harry22222 Gravity Falls would be awesome, Personally I'd like a Mystery Shack with the most recognizable figures rather than a CMF Entry though. For those saying Edna Mode is the same as the one from the polybag . . . go back and look at it. This one looks significantly better . . . way less cartoony. I love their choices!! ?? Definitely want the Hercules and Hades to continue with the mythological theme along with Thor, the Ocean King (aka Neptune), Cyclops, Medusa, Battle Goddess (aka Athena), and (arguably) Maui. With Huey, Dewey & Louie already accounted for I fear we will now never see the Spaceship Valley Forge or its crew from the film Silent Running ever appear as an Ideas set..... Yes I know it was never likely. I'm surprised and delighted to see Jack and Sally, even though Sally has printed legs instead of a cloth skirt. I didn't expect for Hades to be smoky, so that's nice, and I'm glad they did Edna justice with new parts. If only her Incredibles 1 body wasn't so hard to come by. I'm going to get the whole series. I'm sure there will be a series 3 plenty of Disney characters to keep making minifigures for! Dang... other than Hercules, Frozone and the two Aladdin figs, these really don't look good. @Aardvark17 I guess it's not too hard to make a mould as such, but it may be a challenge to make one that produces parts within tight tolerances. That would be necessary for parts that need to connect to other parts, but for a head it's only a long hole in the bottom that needs to clutch to the torso. So I think creating a new head mould is not too difficult. I only see toilet seat and not life preserver. Classic Mickey/Minnie should have been Goofy and Pluto, but glad Scrooge is included. I wish I could go back in time and get the Disney 1 series since I hadn't emerged from my dark period at the time. I would also buy some stocks while I was there so I could be rich. Only really like Chip and Dale, Hades, and then Jack and Sally. Rest of them are kinda meh to me. From what I can gather, this looks like it will be an ongoing series. They've included characters that already exist as minifigures and made some less obvious choices, so they seem to be pacing themselves. So many Disney characters, so few to a series, and so long between series releases. This may take a while. VERY disappointed there's no Pete & goat figure, I believe that and the duplicate Mickey and Minnie figures will only end up hurting sales of the steamboat set. Vaguely interested in Scrooge, the nephews and Chip 'n' Dale (medium legs! ), most of the rest are just too recent for me - don't think I've seen any of the movies since Aladdin. With China's stranglehold on western pop culture (putting ever-increasing demands on Hollywood movies under threat of refusing import) the lack of Winnie the Pooh should be no surprise, not that I'd cared about it anyway. I'm going to go ahead and point out another missed opportunity for the long [Woody] leg assembly that could have been leveraged for a proper Jack Skellington. Why oh why won't they produce more of those?! Will there be a chase figure in this set? I’ve waited three long years for this and my patience has paid off. Scrooge was just a pipe dream of mine and it’s happening!!! 10 of these tie in to ongoing or soon to be released properties. The DuckTales characters are based more on the original series, but the reboot is airing currently, a live action Aladdin is in the works, Frozone 2 is coming this Fall and the Incredibles were just released on DVD recently. That makes Disney happy because it cross promotes films in production or soon to be released. And Series 1 got a lot more figures based on classics, I mean we had Alice and Cheshire Cat, Peter Pan and Hook, Ariel, Ursula, Aladdin, Genie, Stitch to a certain degree. Yeah, expecting them to finish off sets of characters when there is literally decades of characters to pull from we could be seeing Disney Collectible Minifigures for another 60 years. Our kids will be collecting these things until the end of time at this rate. Why are people worried that the inclusion of Classic Mickey and Minnie will hurt sales of Steamboat Willie? That set has the number 24 printed on it instead of 25, it’s going to sell and sell out like hot cakes!!
" With China's stranglehold on western pop culture... the lack of Winnie the Pooh should be no surprise..."
OH MY GOSH. I totally forgot the Chinese president had banned Winnie the Pooh after critics had compared him to the lovable stuffed bear. Bwhahahahaha! I hope Series 3 includes Monorail Homer. Great assortment. Gotta have the Duck Tales cast and Chip & Dale. Hercules and Jafar aren't too bad either. Now that Disney has finalized its acquisition of Fox, I wonder if properties from that extensive portfolio will now get included in future Disney CMF series. Love all the characters in this series! I've watched all of them, except the classic Mickey and Minnie, which I am somewhat familiar. Will be getting the full set as I did with series 1. Each one of them is great! Eat that Disney minidolls! Normally I would jump at the opportunity to get any Duck Tales related character, but somehow all of them (Scrooge, H, D & L or Dagobert Duck, Tick, Trick & Track - as they are called here) somehow seem off in a strange way. Funnily enough, the ones I am far less interested in, Chip and Chap (or Dale over on the other side of the pond), to me seem to best match the source material. Don't care for any of the others. None of the traditional animation films after Aladdin did anything for me, and the CGI ones, while often very good, don't make me want to own related minifigs. Plus, over here we got lots of Disney related CMG like figures over the years from Kinder Surprise eggs and the like, so all my favorite characters I have already got anyway. No need for these (overpriced as always) LEGO renditions for me. And why the Steamboat Willie characters again, directly after the Ideas set? Two wasted spaces in the series, just like the Frozen ones that we already got in several sets. Indeed, why not Goofy? Major oversight. I see great parts material. This made my day. A Scrooge McDuck!!!!!!! Who are all of these people that are saying Frozone already has a minifigure? Edna yes in the Polybag, but this one looks 100x better. I want them all. I am a little disappointed with Jack and Sally. I have been wanting them sense the first wave. I wish Lego had used the Woody and Jessie body and legs from the original Toy Story sets. I expect Goofy to show up in Series 5. WWWWWWWWWWWWWWHHHHHHHHHHHHHHHHHHHEEEEEEEEEEEEEEEEEEEEEEEERRRRRRRRRRRRRRRRRRRRRREEEEEEEEEEEEEEEEEEEE IS GOOFY and PLUTO????????????????????????????????????????????? What might have made sense on the Steamboat Willie figures, is if they had made these figures colored, and left the Ideas set as B/W. At least then they would have been unique. But I was hoping for Aurora too, since the fist series had no pairs for Malificent and Aladin. Frozone _and_ Frozen! Anna and Elsa look great, but the fact that they have matching winky faces seems really odd considering I don't think either of them ever winked in the movie or short films. And the giant snowflake as an accessory for Elsa seems phoned in at best. A better Edna is nice, but the truth is she's unlikely to feature in many layouts where Frozone is kinda critical if you want to recreate certain scenes. The inclusion of Hercules/Hades takes me back to a very odd year where every movie I watched got progressively worse until the summer season bottomed out with Batman & Robin, and then _slightly_ rebounded with Disney's Hercules, but the ironic thing is that for all that I hated the animation going in, the one thing that really started to win me over was realizing that the character designs were a stylized version of the artwork found on ancient Greek pottery...and the Hercules minifig shares almost none of that look (even if they'd included the curlicue chin dimple it would have helped). Mickey and Minnie look even better in this version than they do with the silver treatment, but I suspect these minifigs were planned with the possible intention of releasing this wave to coincide with Mickey's 90th last year, and with the Steamboat Willie set basically beating this to the punch they had to do _something_ to differentiate the two versions. To date, I don't think there's been a single CMF that has been released concurrently in any non-CMF set, though a few of them have shown up later with no changes. Arkham Joker was probably the closest, but they did give him a different head even if the torso print is virtually identical. Jack really should have used the old Woody/Jessie/Zurg arms and Woody/Jessie legs (and on a related note, TS4 Woody should have as well), but that would have made it tricky to make a Jack-as-Santa minifig, which is pretty much a requirement at this point. If you weren't already aware, the person(s) Disney bought the Winnie the Pooh license from 20 years ago didn't actually own the property or have any business entering into licensing partnerships over it. There were three more sets from 2011 that feature an entirely different Pooh design, so maybe they got a legit deal the second time around. Anna and Elsa minifigs have never appeared in any set before, and this saves me from having to shell out through the nose to get good custom minifigs of them. Lilo should have come out in the same wave as Stitch. If you think about it, Disney 1 had 18 minifigs, which broke down into 8 matched pairs and two stand-alones which were Stitch and Maleficent. Having already done Stitch, Lilo is far less likely to appear as a CMF. Having already done Maleficent, they missed an opportunity to pair her with the matching Princess. This new batch is again 18 minifigs, but this time you get one quartet and seven pairs. Frozone has appeared in Brickheadz form, in the LEGO Incredibles video game, and in several thousand irate posts by AFOLs wanting to know where/when they'd get to buy a Frozone minifig. I'd even played around with the idea of making a custom minifig to the point of figuring out that the best torso would be the Mighty Micros Captain Cold (never came up with even a hint of a solution for the head, though). And Tim Burton's Nightmare Before Christmas is/was incredibly popular, if a bit un-Disney-like. While the triplets were originally introduced with the RGB color-coding, classically they were drawn wearing black shirts and either matching black, or RGB baseball caps. Scrooge was drawn with a red jacket. Those four minifigs are actually a dead ringer for the original Ducktales series from 1987. It's just you. They made 50/50 short legs for Dobby in the Harry Potter CMF series. Than you Lego! I'm relieved that I can get the classic Mickey and Minnie seperately. @Purple Dave: Dobby’s legs in that series were just regular short legs. Not true. On the original Dobby, they were indeed plain tan legs, but since the arms and head were also tan it has the unfortunately effect of making him look like he's flashing you. The second Dobby also had tan legs, but with flesh arms and head, it makes him look like he's wearing pants. So, neither look really worked, and there's very little chance that they'd release short legs in flesh, but the Bart Simpson legs also wouldn't work because it'd make him look like he was wearing shoes. So, new 50/50 legs makes it look like the hem of the potato sack hangs down below his groin, while making it clear that he's not wearing anything but the potato sack. @Purple Dave: Oh, my bad. The Bricklink picture clearly shows I’m mistaken. I got that Dobby a while ago and my colorblind eyes didn’t notice that they were dual-molded until just now. Thanks! Eh, lots of people missed that because the two sections are so close in both hue and value that they can read like the same color if you don't look closely. In a way, it was a bit disappointing that they didn't start with a more exciting color combination, but in all likelihood they would have just kept using the Bart Simpson legs, and a situation like this is exactly what it took to force the issue. And actual colorblindness? I once diagnosed a woman with colorblindness over the internet. She'd commented on how amazing a certain Bionicle part looked in some shade of purple, which obviously I had to know about because the closest I was aware of was dark-blue. And her kids were able to confirm that it was indeed boring old dark-blue after all. Terribly disappointing for me, and probably very weird for her. If she'd been born maybe ten years later, mandatory screening in grade school would have caught it decades earlier in her life.